Once in a great while, one comes across an instrument that challenges their conceptions of what master craftsmanship can truly be. 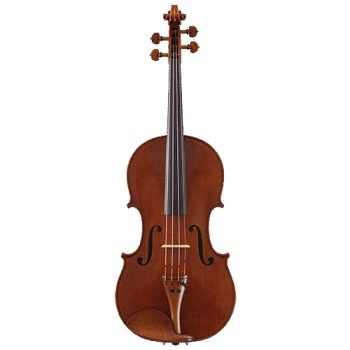 This astounding viola is one of these rare instruments. This viola won a Silver Medal for workmanship at the 2014 VSA Competition, a very prestigious award indeed. The one piece back and ribs are made from one piece of quarter sawn willow wood. The attention to detail is superb, with precise corners, graceful curved bouts, and a glassy smooth scroll that looks like it could have been carved from fine marble rather than wood. Once one finishes marveling at the instrument itself and can continue to playing it, the experience will not disappoint. The sweet, singing alto voice of this viola is operatic and complex, well suited for solo work, or for bringing out the inner voices of a quartet. If you are a professional looking for a lifetime instrument, do yourself a favor and come see this superb viola for yourself.